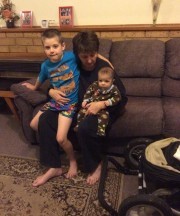 my name is karen and im a divorced mother of 2 kids and 3grandkids whom i love to bits i live in melbourne australia i have so many friends plz feel free to be my friend i have meet some nice people on here the list is too long to mention all of u you know who you all are and especially to poodles for being my friend and partner i love you all to bits..
hey cute pis<33 how ya ben ? Happy Happy Birthday Buddy!! Hope this year is full of many Magical Moments and Memories! Hi Mum. I am requesting u as a friend.